The lead acid battery positive plate is PbO2 , and negative is soften metal of Pb, the electrolyte inside is H2SO4 . Since the battery discharged, redox reactions were carried out on the plates respectively forming PbSO4 and H2O, It means PbSO4 is inevitable as battery discharge or self-discharge, with the increase of discharge depth, the amount of PbSO4 will be more. In theory, batteries should last many years, but they usually don`t because of a series of detrimental problems caused by [excessive sulphation buildup" related to the natural and necessary formation of sulfate crystals on the surface of lead battery plates. With the rapid rise and development of Internet e-commerce sales, express delivery business has also been rapid developed. As the main means of transportation, a large number of electric tricycles and motorcycles used in express business, but the battery problems and early failure have plagued owners since its applied until thought to be "dead" or duo to be downtime. Sulphation and water loss of lead-acid batteries are the main cause for cells capacity loss and downtime. Repair your old and used batteries by our Off line Battery Repair System or maintain your new battery as everyday charging link with our 60V Power Battery Charging Repairer. You can now give your batteries a second life or extend battery life to be doubled. As you will read, the application of this technology is kind of just as "doctors treat patients in hospital" to keep it healthy again or recover it as new battery for a longer time. Although the battery of electric tricycles and motorcycles is not excessively expensive, its cost goes up dramatically when you include the cost of downtime, disposal and delivery failure. 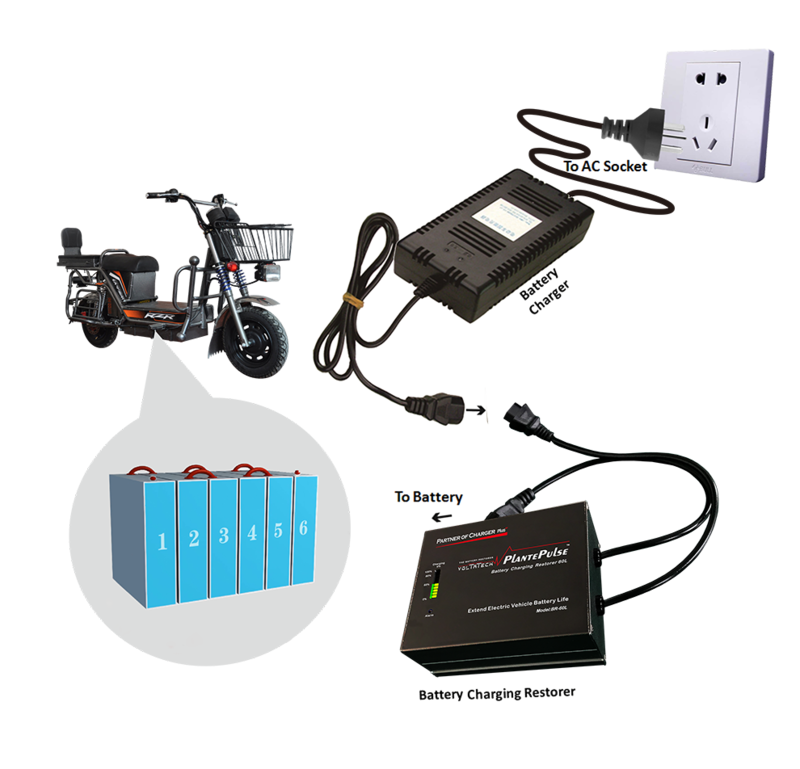 These costs will be reduced or even eliminated by simply extending battery life and increasing battery efficiency after you install our eTricycle Battery Charging Repairer with battery optimizer function, also we call it as eTricycle Battery Charging Maintainer or eTricycle Battery Charging Desulfator. Step 1: Before used, first check the polarity of the charging port on the battery bank, It should be consistent with the input and output polarity of the bottom of the Battery Charging Restorer device to be used, otherwise it will damage the 60V ETRepair150Ah Battery Charging Maintainer device or your charger. Step 4: The 60V ETRepair150Ah Battery Charging Maintainer Device will automatically measure the battery voltage. After it is normal, please insert the input plug of the charger into the electrical outlet. The 60V ETRepair150Ah Battery Charging Maintainer device will remove sulfated crystals in the charging process. The 60V ETRepair150Ah Battery Charging Maintainer identified herein is covered by a 2-YEAR warranty valid from the date of purchase. This warranty covers defects caused by faulty components or workmanship, including the labour required for repair in our authorized workshops.This warranty does not cover defects caused by incorrect installation, improper use or abuse. The existence of such causes shall be determined by our workshops technical services. Looking for ideal ETricycle Battery Charging Repairer Manufacturer & supplier ? We have a wide selection at great prices to help you get creative. All the ETricycle Battery Charging Maintainer are quality guaranteed. We are China Origin Factory of ETricycle Battery Charging Desulfator. If you have any question, please feel free to contact us.